President Donald Trump’s burgeoning trade war has prompted some big names to join the fight on tariffs. Of the 20 largest spenders that indicated they were lobbying on tariffs in the most recent round of disclosure filings, nine of these companies or trade associations began doing so in the past year. Microsoft, another tech leader on the list, began lobbying Trump’s Commerce Department on solar tariffs at the end of 2018. Earlier this year, the Trump administration approved tariffs on solar panel cells imported from China. 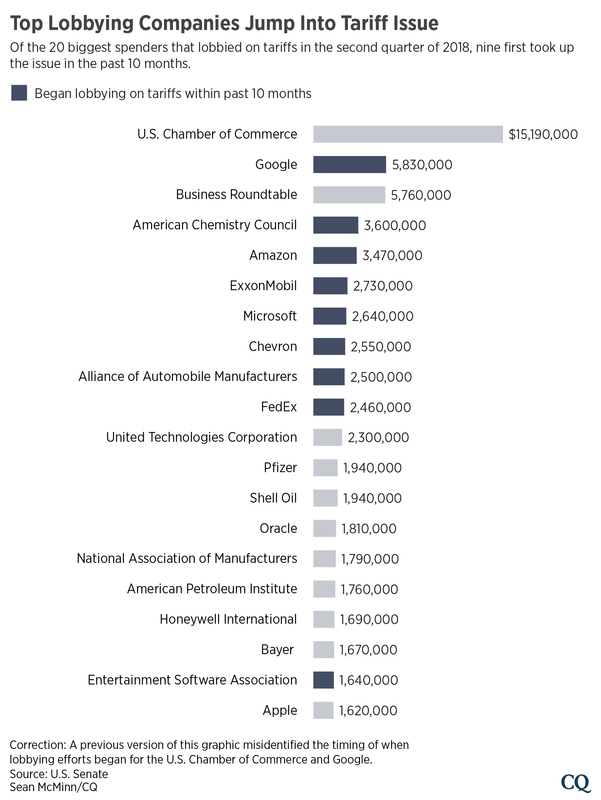 Other big spenders new to the tariff game include the American Chemistry Council, Amazon, Exxon and the Alliance of Automobile Manufacturers. The biggest spender that lobbied on tariff issues was the U.S. Chamber of Commerce, which spent $15.2 million. The disclosure reports, which are mandated by Congress, do not require filers to break down how much they spent lobbying on different issues. Beyond targeting the Commerce Department and Congress, lobbyists have worked to influence other agencies on the tariff issue — the Department of Defense, U.S. Trade Representative and the National Economic Council among them. Trump began discussing tariffs during his campaign for president, when he threatened to slap tariffs on Chinese goods. He made good on those threats this year, expanding the scope from solar panels and washing machines to steel and aluminum imports. China, Mexico, Canada and the European Union have responded with retaliatory tariffs. Correction: A previous version of the graphic in this story misidentified the timing of when lobbying efforts began for the U.S. Chamber of Commerce and Google.